Have you purchased what you thought was high-end audio or video equipment in the past, only to be frustrated when you got home and couldn’t get it to work? Have you tried installing audio cabinetry into your home, and were disappointed with the results? At Stereotypes that will never be the case. Our team of installation specialists live up to the high standards set by the Gonzalez family. Each and every sale is followed by our award winning installers to ensure that you are satisfied with your purchase, with no hassles and superior results. If you are planning the construction of a new home or office, bring us your blueprints and let us show you how to optimize your new environment with superior audio and video components installed to your specifications and within your budget. Already have a home theater or listening room but just need an update? Maybe you have a room that you’re ready to convert. Either way, the team at Stereotypes can help you make the most of your existing space. It’s unfortunate and rare, but things do go wrong with all electronics. 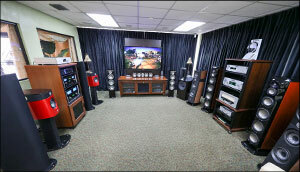 The team at Stereotypes is trained and experienced in all facets of A/V repair. In addition, we maintain solid relationships with manufacturers and their repair houses. We are the area’s leading installation company with the experience and professionalism you demand. For examples of what we can do and more information on our many services please come to see our showrooms or contact us.